The Maldives is the smallest country in Asia by population and land, but spread over 90,000 square kilometres of ocean, and dotted with countless atolls and reefs, diving the Maldives is probably on every divers’ bucket list. An island nation of 26 coral atolls scattered with 1192 islands, it’s obvious that in the Maldives diving is the top tourism activity. Only 185 of these islands are reported to be inhabited, but it seems that everyone is home to one or more luxury resorts. The Maldives features postcard-like vistas of white sandy beaches, swaying palm trees and clear blue water. 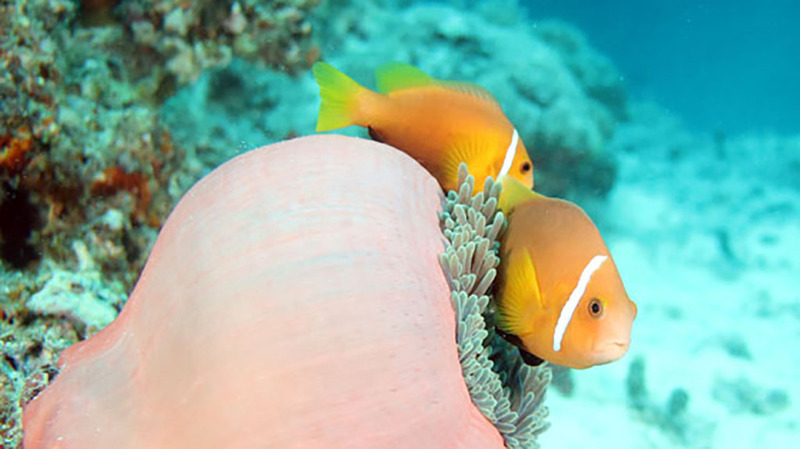 However, the Maldives best features are found underwater on its rich coral reefs, which abound with marine life both large and small, and the best way to get around as many of these as possible is by liveaboard. 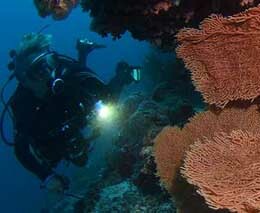 Maldives scuba diving offers endless adventures for all levels of scuba diver. For the inexperienced diver there are shallow coral gardens in the lagoons, home to a wide variety of reef fish and invertebrates. 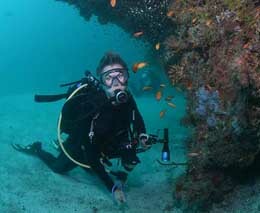 More experienced divers can explore walls, pinnacles, shipwrecks and enjoy fast-paced drift dives through reef channels. 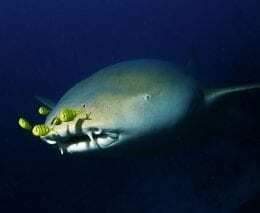 At these sites divers will encounter pelagic fish like barracuda, trevally, mackerel, batfish and snapper, plus turtles, sharks, rays, moray eels and a wide variety of schooling fish. The Maldives is probably best known for is large marine life. 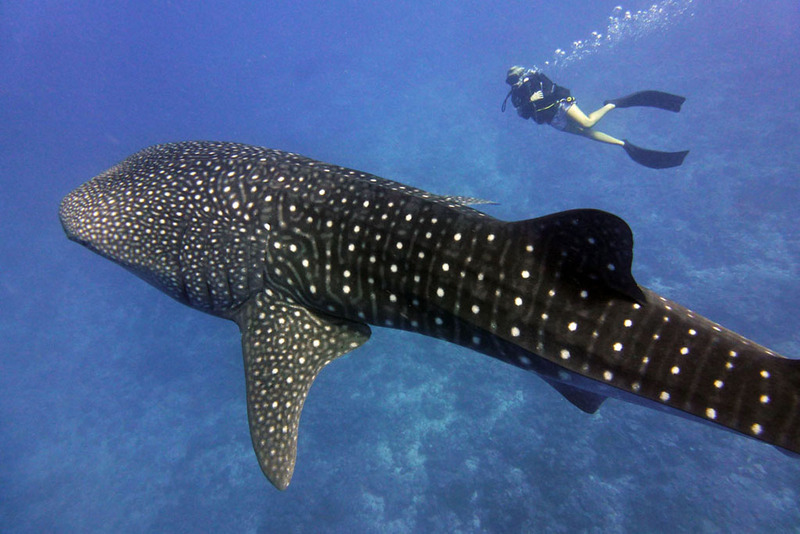 While numerous shark species are seen on most dives, it is also a great place to encounter whale sharks. In most parts of the Maldives, they are seasonal, but South Ari Atoll has a population of juvenile whale sharks, year-round. The Maldives is home to the world’s largest population of these massive rays. Manta rays gather at numerous sites throughout the Maldives, hovering over bommies to get cleaned or swarming in lagoons to feed, sometimes in plague proportions at Hanifaru Bay. And during your stay there is a good chance you will see whales and dolphins, with 21 species of cetaceans in the area. There are literally hundreds of dive sites to explore in the Maldives, and several ways to explore them. You can stay at a resort, or several, during your stay and dive the nearby sites, which is perfect if you have a non-diving partner or young children. 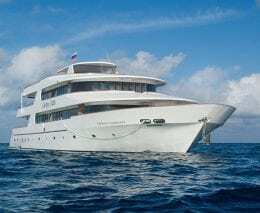 However, the best way to explore the Maldives scuba diving is to join one of the many liveaboard vessels that ply these waters, allowing you to explore four or more atolls during a week-long trip. The Maldives is located in the middle of the Indian Ocean, southwest of India and Sri Lanka. The atolls of the Maldives are located between 1 degree south and 8 degrees north of the equator. Most resorts in the Maldives have a dive centre attached, which are ready to take you to the nearby dive sites. The country also has over 150 liveaboard vessels. 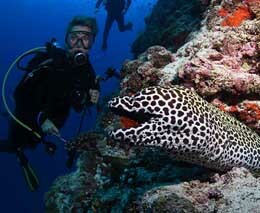 With 26 atolls spread over a wide area of the Indian Ocean, there are literally hundreds of dive sites in the Maldives. 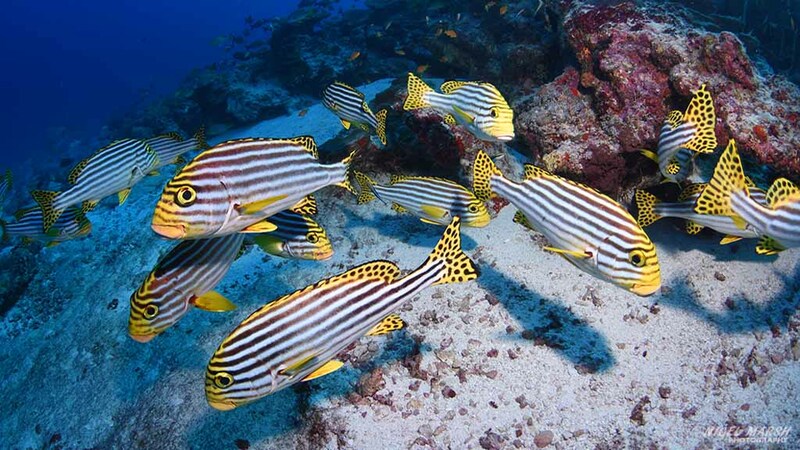 Located atop the Chagos-Maldives-Laccadive Ridge, a 960km long submarine mountain range, the atolls of the Maldives rise from deep water and are a haven for a wide variety of marine species. The reefs of the Maldives are home to 187 species of coral, over 1100 species of fish and countless species of invertebrates. Divers can explore shallow coral gardens, gentle sloping reefs, shipwrecks, artificial reefs, coral walls, pinnacles and reef channels. Currents are very common in the Maldives and are used to do drift dives, especially through reef channels, known locally as a kandu. These dives generally start on the outside of the reef, drifting to the channel opening. Then, using a reef hook, divers clip onto a piece of dead coral and watch the passing parade of sharks, pelagic fish, reef fish and sometimes dolphins, marlin and other spectacular marine life. After twenty minutes divers unhook and glide along the channel into the safety of a sheltered lagoon, exploring ledges and caves on the way. 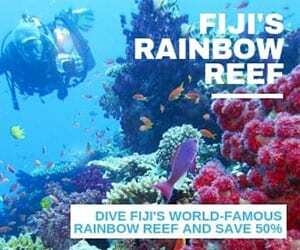 Drift dives are also done along coral walls and reef slopes where divers will see pretty corals, abundant reef fish, turtles, sharks and rays. 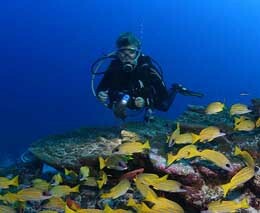 Pinnacles, known locallyas a thila, are also very popular dive sites. Most of these are found in lagoons, so often have weaker currents, depending on the tides. These rise from 30m or 40m and terminate around 5m to 10m from the surface. These pinnacles act like a beacon for marine life and attract schooling fish, sharks, rays, turtles and many reef species. For those into wrecks, there are a number of shipwrecks to explore, and also many purposely sunk vessels that are fun to dive.Most of these wrecks are now wonderful artificial reefs, covered in pretty corals and home to a wide variety of marine life. While every atoll in the Maldives could be a complete destination, the country is generally split into three zones based on liveaboard itineraries. The most popular, and easiest area to explore, are the Central Atolls. Located close to the capital of Malé, the atolls in this central region contain some of the most famous dive sites in the Maldives. The most popular Central Atolls include North and South Malé, Vaavu, Meemu, Rasdhoo and the legendary North and South Ari Atoll. On a 7-day liveaboard trip through the Central Atolls divers will see schooling fish, pelagic fish, sharks and many manta rays. The Central Atolls can be dived at any time of the year, but are at their best from December to May. Currents are very common on the Central Atolls, and the main reason these reefs are so rich with marine life. It is possible to avoid currents when diving sheltered sites in lagoons, but to experience the best sites you will have to contend with the currents. These currents are generally strongest on the outer reef, the channels between reefs and in the narrow channels feeding into the lagoon. 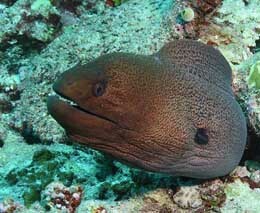 All the dive guides are very knowledgeable about these currents and use them to do drift dives. 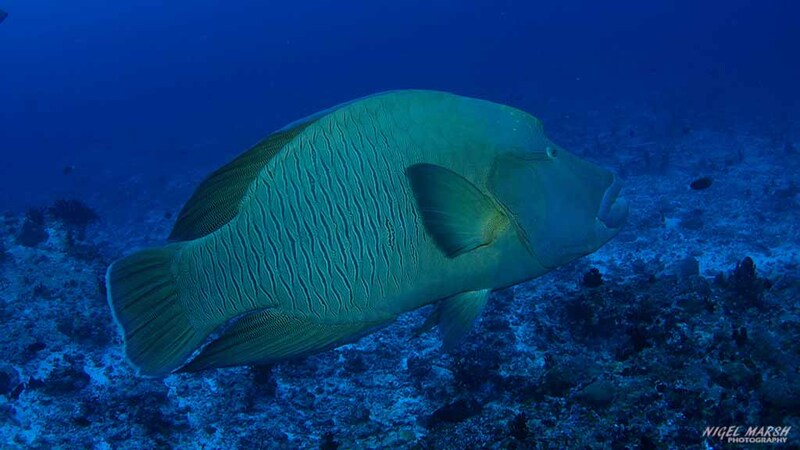 These current dives on walls and channels are the best way to see sharks, barracuda, trevally, mackerel, batfish, Maori wrasse, groupers, eagle rays and other ocean wanderers. 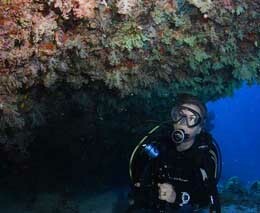 But some of the best dives in this area are on the pinnacles and coral gardens. 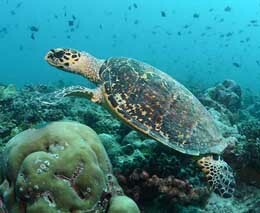 These are home to a wide variety of colourful reef fish, numerous invertebrates, rays, reef sharks, morays and turtles. 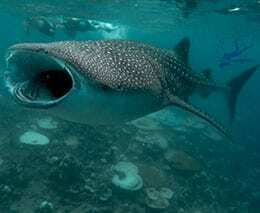 Some are also visited by manta rays and don’t be surprised if you also see a whale shark or a pod of dolphins. 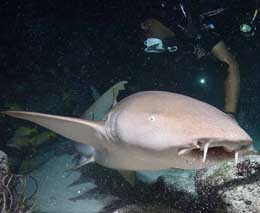 The Southern Atolls are generally only explored between February and April, with this area renowned for sharks. Liveaboard trips to this area often start in Malé and include a few Central Atolls on the journey south, but some trips start in the south, requiring a flight to one of the small airports in the southern region. Popular Southern Atolls include Foammalah, Huvadhoo, Laamu, Gaafu and Thaa. Sharks are the big attraction in this area, especially in the fast flowing channels, with grey reef sharks, silvertip sharks, whale sharks, silky sharks, hammerheads and even tiger sharks to be seen. 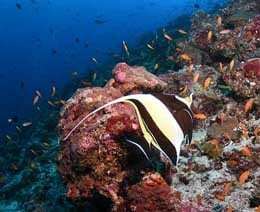 This area also has nice corals and good fish populations, plus the dive sites are far less crowded than the Central Atolls. Unfortunately with strong currents and deep water this area is only for experienced divers. The Northern Atolls are reputed to have the best corals and macro critters found in the Maldives, but most divers head to this area to see manta rays and whale sharks. The atolls in this region are generally only dived between July and October when the new moon creates large tidal flows and soupy plankton blooms, food for ocean giants. 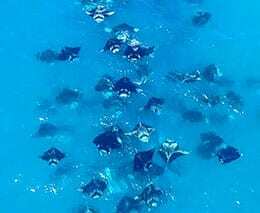 The main attraction is the squadrons of feeding manta rays in Hanifaru Lagoon at Baa Atoll. Dozens, and sometimes hundreds, of manta rays, gather in this lagoon and are often joined by several whale sharks. 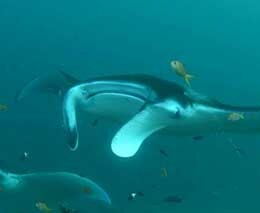 You can only snorkel this location, but liveaboard vessels visit other sites where the manta rays get cleaned. The Northern Atolls also have many wonderful pinnacles and channels to explore, and the best cave dives in the Maldives. The most popular atolls visited in this region are Baa and Lhaviyani, but some also explore Raa and Noonu, plus a few of the Central Atolls on the journey to or from Malé. Diving conditions in the Maldives are dictated by two monsoon seasons. The northeast monsoon runs from December to May, bring calm seas and clear water (20m to 40m visibility) to the eastern atolls, but often stirred up conditions on the western atolls (8m to 15m visibility). This is generally the most popular time for diving. From June to November the southwest monsoon brings clear water to the western atolls, but also rougher seas across the island nation. 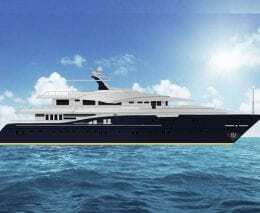 Less liveaboard options are available at this time of the year. Water temperatures in the Maldives vary from 26°C to 29°C, so a 3mm wetsuit is ideal. The coral reefs of the Maldives have been hit by several coral bleaching events, the most recent in May 2016. This coral bleaching is reported to have affected up to 60% of hard corals on some reefs, with much of the coral later dying. I dived the Central Atolls in February 2017 and saw lots of dead hard coral. It was sad to see, but it didn’t detract from the diving, as the marine life was rich and plentiful. Over the next few years, it is hoped that much of this hard coral will come back, returning these reefs to their former beauty. If staying at a resort your choices will be endless, but look for one that has a dive centre attached or advertises itself as a dive resort. 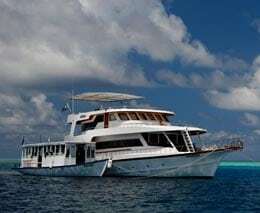 Choosing a liveaboard can be just as difficult with over 150 plying the waters of the Maldives. There are basic budget liveaboards and luxury liveaboards, plus everything in between. We have selected just five modern and comfortable liveaboards, all of which we can vouch for, with a variety of itineraries to choose from, which include some special ‘dive with a purpose’ trips. If arriving a day or two before your liveaboard trip you can either stay in Malé or close to the airport on Hulhule Island. Hulhule Island is more convenient, as the liveaboards depart from here, with most pickups done from the airport. 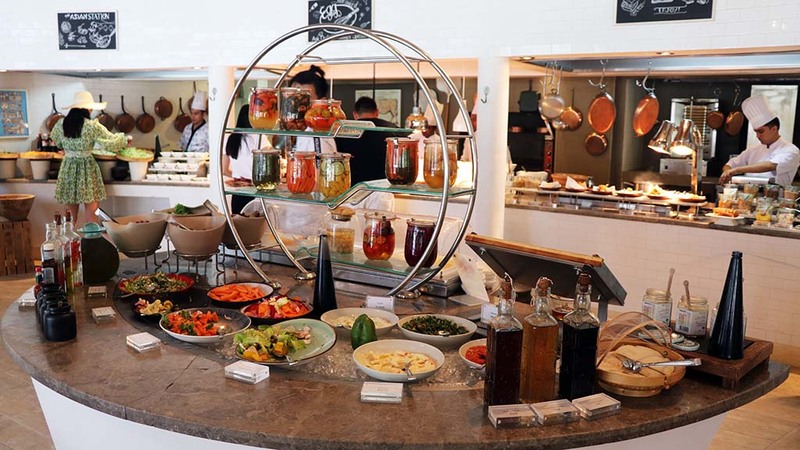 You will be a captive audience for meals at your resort or on your liveaboard, with both offering a great mix of western and Asian cuisine. If you can, try some traditional Maldivian food. Heavily influenced by Indian cuisine, Maldivian food is generally made up of three elements – fish, coconut and rice, and mixed with some wonderful spices their curries are fabulous. There are only two ways to get around the Maldives, by boat or seaplane. Ferries operate between the islands, which are great for short runs between Malé and the airport, but not so good for a journey to your resort if it is several hundred kilometres away. Most resorts operate seaplanes, with the Maldives home to the world’s largest fleet of seaplanes. The views from the seaplane are spectacular and there is no better way to arrive at a resort than via one of these flying boats. With the Maldives, 99% water, watersports are the main activity that most tourists enjoy. 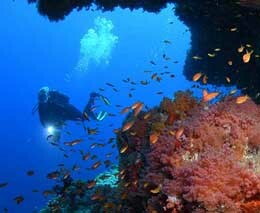 The diving is naturally first class, and snorkeling can be enjoyed at many locations. However, many resorts also offer kayaking, water skiing, windsurfing, jet skiing, kite surfing, sailing, parasailing and fishing. A visit to Malé is highlight recommended to soak-up Maldivian culture and to experience the most densely populated island on earth. A tour ofMalé is offered at the end of many liveaboard trips as a surface interval before your flight home. You can stroll along the waterfront and marvel at the crystal clear water, or visit the fish or vegetable markets. For more culture, visit the Grand Mosque, the National Museum or the monument to the victims of the 2004 Tsunami. Make sure your hotel, resort or dive operator knows your flight details for your arrival in Malé, as there are no taxis from the airport. 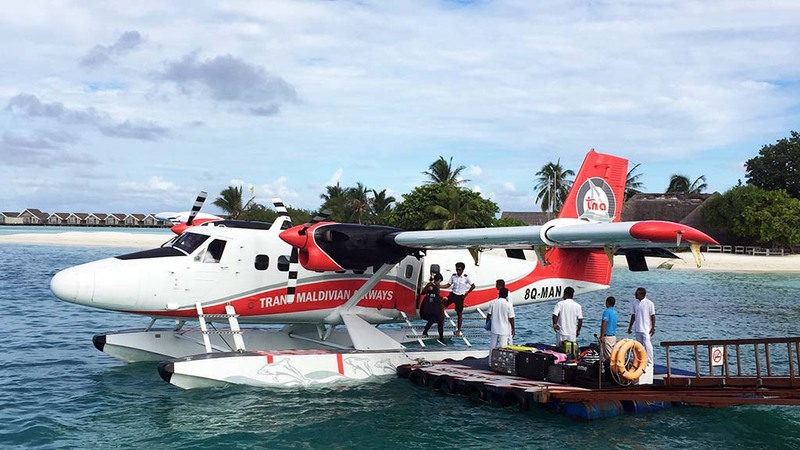 If staying in Malé or near the airport the hotel should organize a pickup, otherwise, staff from your resort or liveaboard boat will greet you for a transfer to your boat or seaplane. 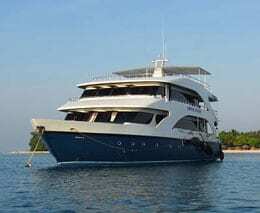 Liveaboard trips in the Maldives are a little different to other countries, with the vessel having no dive deck. Instead, all diving is done off a tender boat known as a Dhoni. This boat, which can be 20m long, houses all the dive gear and the compressor. The beauty of this system is that it frees up space on the main boat, so larger cabins, and also no noisy compressor and no smelly wetsuits. Diving regulations in the Maldives limit divers to a maximum depth of 30m. This may sound a little restrictive, but most dive sites are above 30m. This depth limit also makes the Maldives the perfect place to use nitrox, with many of the liveaboard boats providing it free of charge. So if you haven’t done a nitrox course it is highly recommended before a trip to the Maldives. The Maldives enjoys a tropical monsoon climate, with the average daily temperature throughout the year around 30°C and the night time temperature rarely dropping below 25°C. The country experiences two main seasons, the dry season associated with the northeast monsoon from December to May, and the wet season from June to November during the southwest monsoon. Water temperatures vary from 26°C to 29°C, so a 3mm wetsuit is comfortable year round. The Maldives has a standard voltage of 230V and a standard frequency of 50Hz. There are two types of power sockets in use in the Maldives, the type G (as used in the UK) with 3 rectangular pins and the type D with 3 round pins. The currency of the Maldives is the Rufiyaa (MRF), and it is not generally traded outside the country so is difficult to get prior to arrival. ATMs and currency exchange outlets are located at the airport. However, many tourists to the Maldives never have to use the local currency at resorts, on liveaboards or at tourism-related business as most payments are generally made via credit card or with US dollars. The most widely accepted credit cards are Visa, Master Card, American Express, Diners Club, JCB and Euro Cards. Tipping is not expected in the Maldives, but it is appreciated, especially on a liveaboard boat with the money spread evenly between the hard-working crew. There are 3G and 4G networks in the Maldives, with the largest phone company Dhiraagu, reported to offer 100% coverage of the islands and atolls. If you don’t have international roaming, you can purchase a SIM card at the airport, however, WiFi is widely available at resorts and on liveaboard boats. For those that still like to write letters and send postcards, Maldives Post provides postal services to the rest of the world. All visitors to the Maldives are issued with a free 30-day visa upon arrival. However, please ensure your passport is valid for the time of your visit and doesn’t expire within the 30 day visa period. No compulsory vaccinations are required for the Maldives. The country is free of malaria, however during the wet season, there is an increased risk of dengue fever. Medical services in the Maldives are limited, with Medical Clinics found on most islands, but there are only two hospitals in Malé. There are two recompression chambers in the Maldives for the treatment of decompression sickness. One is located at Bandos Island Resort, North Malé Atoll and the other at Kuramathi Island Resort, Rasdhoo Atoll. The Maldives is a Muslim country and being on the major seafaring route between Asian, Africa and Europe it has a very rich culture with influences from all these regions. It was a British protectorate for many years and since independence in 1965 it was a member of the Commonwealth until it withdrew in 2016. 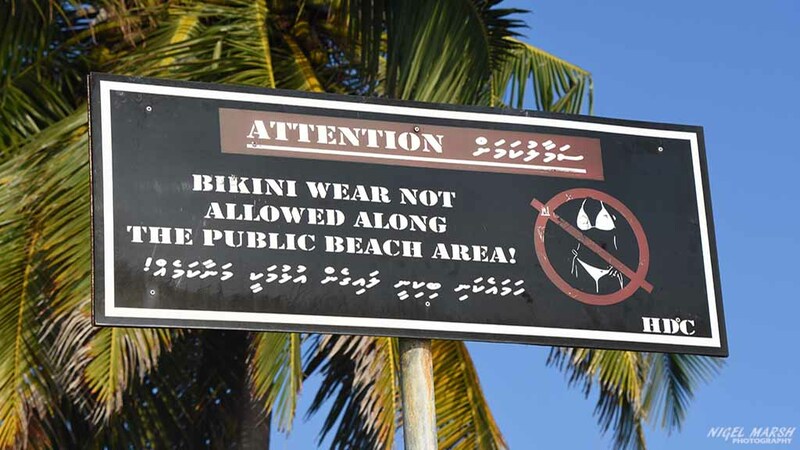 The Maldivian people are very friendly and welcoming to visitors, but expect tourist to respect their customs, by dressing modestly in public. Being a Muslim country, alcohol is banned. You cannot bring alcohol into the country. Fortunately, alcohol is widely available to tourists at resorts and on liveaboard boats. The national language of the Maldives is Dhiveli, however English is widely spoken, especially in the tourism industry. Local and expat dive guides work at resorts and on liveaboard boats, with many speaking French, German, Spanish, Italian and Japanese. Malé International Airport is the gateway to the Maldives and is serviced by flights from many countries. Coming from Australia, or the nations of the Pacific, the most popular route is via Singapore, but flights are also possible through many major airports in South-East Asia, India and Sri Lanka. Divers coming from Europe will find that many airlines offer direct flights or will transit via Dubai and Doha. 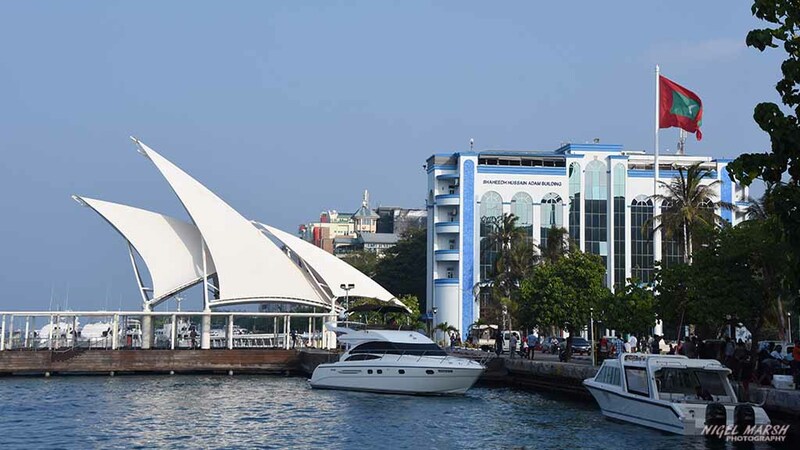 The airport is located on Hulhule Island, adjacent to the capital Malé.